The range of issues for driving and community mobility is vast and can extend across the lifespan. 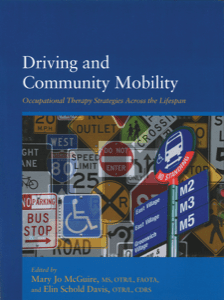 Occupational therapy professionals who are generalists or specialists have the knowledge and skills to address the important IADL of community mobility, including driving. Therapists, through evaluation, intervention, and consultation, can address not only driving and community mobility skills but also the underlying skills (visual, motor, or cognitive) and environmental and other contextual factors that enable and empower a person to participate in the community. This text provides strategies to address community and driving across occupational therapy practice areas and settings, including administration and management, schools, acute care hospitals, rehabilitation centers and skilled nursing facilities, and outpatient clinics, and with clients with various disabilities or difficulties, including developmental, physical, sensory processing, vision, and mental health. Includes a flash drive containing client resources, fact sheets, guides, assessments, articles, and Web resources. This text, which is also available as a Self-Paced Clinical Course (earn 2 AOTA CEUs [25 NBCOT PDUs, 20 contact hours]), provides strategies to address community and driving across occupational therapy practice areas and settings, including administration and management, schools, acute care hospitals, rehabilitation centers and skilled nursing facilities, and outpatient clinics, and with clients with various disabilities or difficulties, including developmental, physical, sensory processing, vision, and mental health. Driving and Community Mobility: Occupational Therapy Strategies Across the Lifespan, which gathers researchers and clinicians in a team effort to offer expert guidance for occupational theray's work in the ever-developing practice area of driving and community mobility, includes a flash drive containing client resources, fact sheets, guide, assessments, articles, and Web resources. Chapter 3. Welcome to the Team! Who Are the Stakeholders?